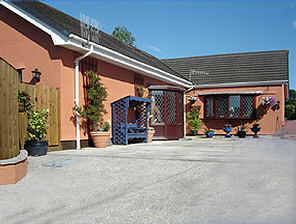 Ystradgynlais accommodation in friendly Ystradgynlais hotels, B&B, Bed and Breakfast, homely Guest Houses, cosy Holiday Cottages, congenial Country Pubs and Inns, luxurious Ystradgynlais Country House Hotels and Caravan and Camping sites. 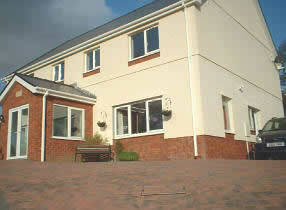 situated on the edge of the Brecon Beacons National Park. Located on the outskirts of the village of Ystradgynlais, in the lovely Upper Swansea Valley, Pen Pentre guest house enjoys views of open fields stretching to the hills of the Brecon Beacons to the rear and to the front of the house, behind the village, can be seen the Black Mountains. In this well appointed, spacious, guest house, Sharon and Stan Parker offer you a very warm welcome, in homely accommodation. Delicious meals are available from a choice of cooked or continental style breakfasts which include everything you might expect (plus healthy options), to evening meals or light suppers of up to three courses on request. All our meals are freshly cooked to order and ingredients are sourced locally wherever possible; all our bread is homemade. The comfortable bed and breakfast accommodation consists of two double rooms, one with en-suite shower room, the other with exclusive, adjacent, private bathroom. There is also a spacious suite with double/twin bedroom, en-suite shower room and private lounge. From here there is access to the front garden with a private terrace on which drinks can be enjoyed on warm summer evenings as the sun sets over the Black Mountains. The dining room overlooks the rear garden where there is also a patio area with outside seating and uninterrupted views over farmland to the Brecon Beacons. All rooms have comfortable seating with colour TV, coffee and tea making facilities. Complimentary afternoon tea is provided in the guest lounge or garden. We have an extensive library from which guests are welcome to select reading material for their enjoyment during their visit. Holtwood was built as a luxury family home on the edge of the National Park. An ideal spot to explore the countryside of South Wales and all its attractions. Holtwood is a family run bed and breakfast, ideally suited to explore the National Park, and South Wales. All rooms are En-suite and have TV, hairdryer, tea and coffee making facility etc. We have 2 doubles and one twin. Facilities include separate guest dining room and lounge. Plenty of off road parking and storage for bikes. We try to source all our food locally, where possible organic. While the house may be modern the welcome is traditional. 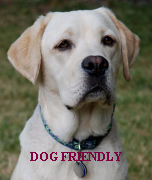 Friendly, relaxed,warm and affordable. Breakfast is served in the dining room where we offer both the traditional full breakfast or the lighter continental. On the sideboard you will find; juice,fruit,cereals,toast,marmalade,jam etc. Were possible our food is sourced locally. Our sausages bacon and eggs are all local. We use free range eggs and only buy products that use the same. We look forward to meeting you soon and assure you of a very warm welcome.